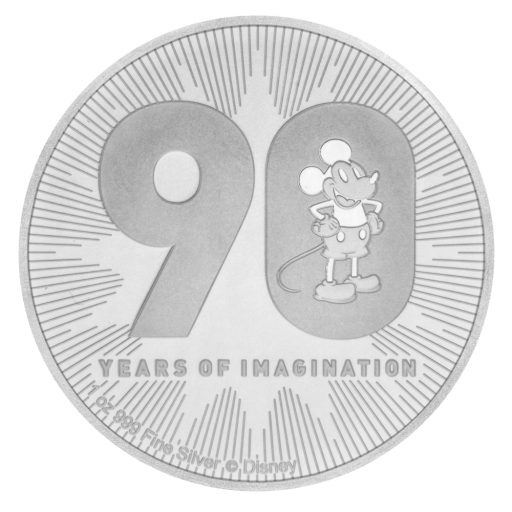 Celebrate 90 years of Disney's original and most lovable character with the 2018 Mickey Mouse 90th Anniversary silver coin. Part of the New Zealand Mint's much-loved Disney collection, it's an essential buy for collectors and Disney fans as well as a smart choice for investors. Don't miss out, order today with coininvest.com. Masterfully-crafted and struck from one troy ounce of fine .999 pure silver, the New Zealand Mint's 2018 1 oz Disney Mickey Mouse 90th Anniversary silver coin is a fitting tribute to one of the world's true heroes. Everyone loves Mickey Mouse. The lovable rascal has been popular with all ages since he was created by Walt Disney in 1928. Recognised around the world, Mickey has wowed audiences with his snappy style and quick wit for 90 years. Mickey Mouse made his screen debut in the 1928 short film, Steamboat Willie, one of the first cartoons to be made with sound. He went on to appear in over 130 cartoons and feature films dressed in his iconic red shorts, white gloves and yellow shoes combo. Mickey has also appeared in thousands of comic books and cartoon strips, tv shows and even video games such as Epic Mickey (2009). He is commonly shown in the company of his girlfriend, Minnie Mouse, his friends Goofy and Donald Duck, and his dog Pluto. He was the first cartoon character to be honoured with a star on Hollywood's Walk of Fame (1978) and visitors to Disney parks around the world are still able to meet him in person. 18 November 2018 was Mickey Mouse's 90th Anniversary and celebrations took place all over the world. To mark the famous mouse's 90th birthday, the New Zealand Mint added the 2018 1 oz Disney Mickey Mouse 90th Anniversary silver coin to its already impressive Disney series. The coin's reverse shows the number 90 in frosted numerals. Mickey is centred in the 0 against a dazzling sunburst style, light refracting and micro-e engraved background. The phrase 'years of imagination' sits under the number 90 while the Disney brand logo and the coin's weight and purity run around the bottom edge. This beautifully designed silver coin is limited to just 90,000 worldwide and, as legal tender issued by the NZ Mint for the island nation of Niue, its obverse carries the Sir Ian Rank-Broadley image of HM Queen Elizabeth II. Add fine silver to your holdings or increase the value of your collection with this shimmering silver Mickey Mouse coin. Order now and add a little piece of history to your collection. The 2018 1 oz Disney Mickey Mouse 90th Anniversary silver coin is available in individual sachets, tubes of 25 or boxes of 250.